The Recopak Bag in Box system is specifically designed to cater for a large range of bladder filled applications. The Recopak Bag in Box machine will erect a cask (box), load the filled bladder into the box in the correct orientation, then close and seal the top and bottom flaps with hotmelt. Handling overlapping major flaps. (e.g. Scholle, Raypak, Flex pack Systems). Catering for applications from 2 to 10 litre standard, other sizes available upon request. Applications include – Wine, Water, Oil, Juice and Dairy just to name a few. Overall productivity is increased while labour costs are minimised. As a fully automatic system this machine only requires one operator. 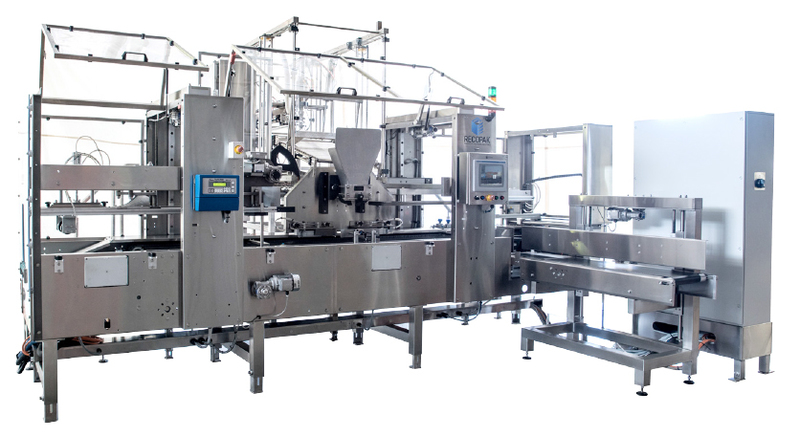 As an option this machine can be supplied with an automatic size changeover system.